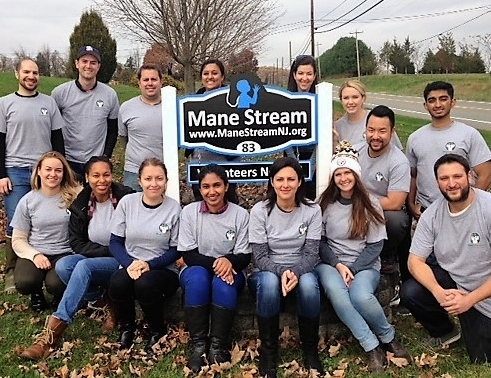 Those 14 years and older may participate in program activities at Mane Stream. we provide our own orientation and training sessions. participate in grooming, tacking the horses prior to lessons, and either leading the horse or sidewalking for our adaptive riding lessons, therapy (OT, PT, Speech-Language) sessions or other equine assisted activities programs. Additional opportunities include helping out with everything from office tasks, barn chores and maintenance. which will cover horse behavior, safety, grooming, tacking, sidewalking and leading skills. *Waiting List: The first 1-3 people usually have the opportunity to join this training session. 3. Read through the Volunteer Manual, print out and complete the quiz located on the last page. Then bring the quiz and the Central Registry Consent Form (mandatory for 18 yrs and older) with you to the Volunteer Orientation. with all aspects of our camp program, including horsemanship skills, riding lessons, horse related games and crafts. Every summer we need 3-4 interns (High School Senior or College Student) who will assist in organizing activites and supervising volunteers for our summer camp for children all abilities. Ideal opportunity for individuals looking for experience working with horses and children with special needs. We welcome Corporate groups, scout troops and high school student groups who want to offer their time to assist with one-day or short-term projects, such as trail clearing, fence painting, landscaping, cleaning, and tack sales. Spend either full or half a day volunteering on the farm! We are always in need of volunteers who have a variety of professional and office administration, graphic and photography skills to help with fundraising events, mailings, and community outreach. Consider helping occasionally throughout the year. Hours are flexible and/or seasonal.